Antioxidants are molecules that prevent or slow cell damage by neutralizing free radicals (damaging effect of oxygen on tissues) with positively charged atoms. The body manufactures antioxidants such as enzymes and uric acid, however the 50,000 or so antioxidants found in plants are also required through diet to help us lessen environmental or external stresses on our cells. 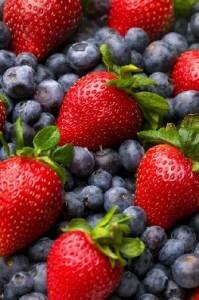 Antioxidants are life promoters, working to slow the aging process. Some of their general beneficial qualities are to reduce inflammation and lessen joint and muscle pain. They can also prevent the oxidative damage to brain cells and have been studied as a beneficial treatment for stroke and neurodegenerative diseases such as Alzheimers. It is however still uncertain whether free radicals are the cause or result of such diseases. As we get older our body's antioxidant defence mechanisms become less effective. Eating more foods rich in antioxidants ultimately makes for a more gracefully aging body. According to The Organic Centre for Education and Promotion organically grown plants have two to three times the level of antioxidants than conventionally grown non-organic plants. The reason being organic farming practices, such as covering crops and using compost instead of fertilizers and pesticides to promote growth, reduces stress on plants whilst growing. The outer layer or skins of produce are the most antioxidant rich. Foods high in antioxidants include red kidney beans, wild blueberries, artichokes, prunes, raspberries, strawberries, pecans and russet potatoes. Plants high in antioxidants are also used to preserve cosmetics, particularly for their anti-aging benefits.